EgyptAir continues to make massive losses as the carrier and Egypt struggle to recover from the Jan-2011 revolution which resulted in the airline moving into crisis mode for two months when it was forced to temporarily ground up to 40% of its fleet and as 80% of revenue evaporated. Egypt’s Minister of Civil Aviation Wael al-Maddawy reportedly told the Shura Council Transportation Committee in Mar-2013 that losses at the national carrier had reached more than EGP6 billion (USD885 million) since the revolution. EgyptAir is yet to publicly release its annual report for FY2012 which ended 30-Jun-2012, but Mr Maddawy said EGP650 million (USD95.7 million) of the losses were due to the weakening of the EGP to the USD. “EgyptAir’s losses are huge, but not catastrophic, [as they won’t] lead to the closure or selling of the company,” Mr Maddawy said. 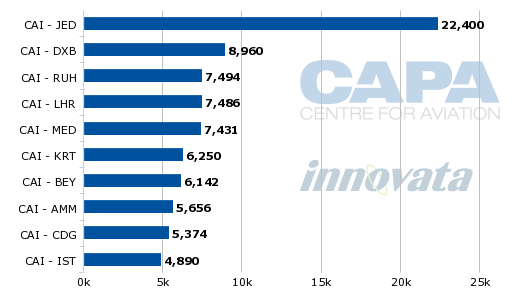 The carrier is burdened with 32,000 employees, when it needs just 12,000 to operate the carrier. Some 20,000 more employees than it needs. However, the carrier is prevented from reducing its headcount due to the prevailing social circumstances, according to Mr Maddawy. The carrier had been optimistic that it could return to profit and resume rapid expansion in 2012 as the economy recovered from the political upheaval and the benefits of network adjustments began to flow to help offset the significant drop in inbound tourism and business traffic. Instead the airline’s losses are reportedly being managed by a committee that includes two American University of Cairo professors and the vice governor of the Central Bank and is headed by the company chairman and CEO Roshdy Zakaria. But a recovering tourism market should help to arrest EgyptAir’s losses. Tourist numbers grew 17% in 2012 according to Egypt's Central Agency for Public Mobilization and Statistics. About 11.5 million tourists visited Egypt in 2012, compared to 9.8 million in 2011, and still well down on the 14.7 million visitors in 2010. Tourism, a vital part of the country's economy, accounted for about 11% of Egypt’s GDP in 2012. The government expects tourist numbers to return to 2010 levels by the end of the 2013, security issues permitting. Egypt also has a long-term target to attract 30 million tourists by 2020. Passengers passing through Egypt’s airports were down three million in 2012 to 15 million compared to 18 million before the revolution, according to Mr Maddawy. While airports in tourism centres of Sharm al-Sheikh, Hurghada, Luxor, Aswan and Burg al-Arab were profitable, 12 others made heavy losses, including three in New Valley. Subsidiary EgyptAir Tourism and Duty Free in Dec-2012 forecast sales of USD200 million in 2013, up from an expected USD170 million in 2012. Chairman Gamal Hammad told The Moodie Report passenger numbers to Cairo were still below 2010 levels, but tourist destinations like Sharm el-Sheikh and Hurghada had recovered quickly since the revolution, increasing 40% in 2012, driven partly by strong charter business from Russia, Ukraine, Germany and Italy. Russian carrier Transaero Airlines operated between 6,000 one-way weekly seats and about 7,500 to Hurghada for most of 2012. But it has reduced capacity to around 4,500 seats per week since Dec-2012. Rossiya Russian Airlines and Aeroflot also compete on the route, offering a small number of seats each. Transaero has also cut back its capacity to Sharm el-Sheikh from more than 4,000 one-way seats per week for much of 2012 to about 2,500 since Nov-2012. Aeroflot also began operating between about 600-900 weekly one-way seats in Oct-2012, but Rossiya pulled off the route in Jan-2013, according to Innovata. Tourism is traditionally only a small part of EgyptAir’s traffic, accounting for about 10% of passengers before the revolution. 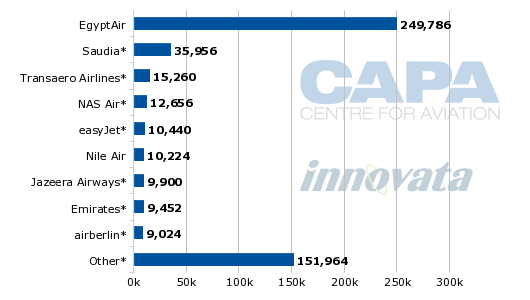 The carrier is more focused on the visiting friends and relatives (VFR) market. EgyptAir deploys the bulk of its capacity to the Middle East, catering primarily to point-to-point VFR traffic as the UAE. 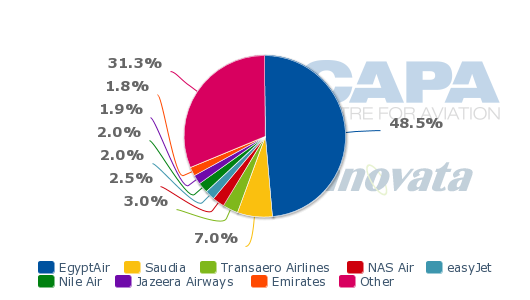 Saudi Arabia accounts for three of EgyptAir’s five largest routes, with Jeddah by far the carrier’s biggest. Middle Eastern destinations make up six of the top 10 routes. 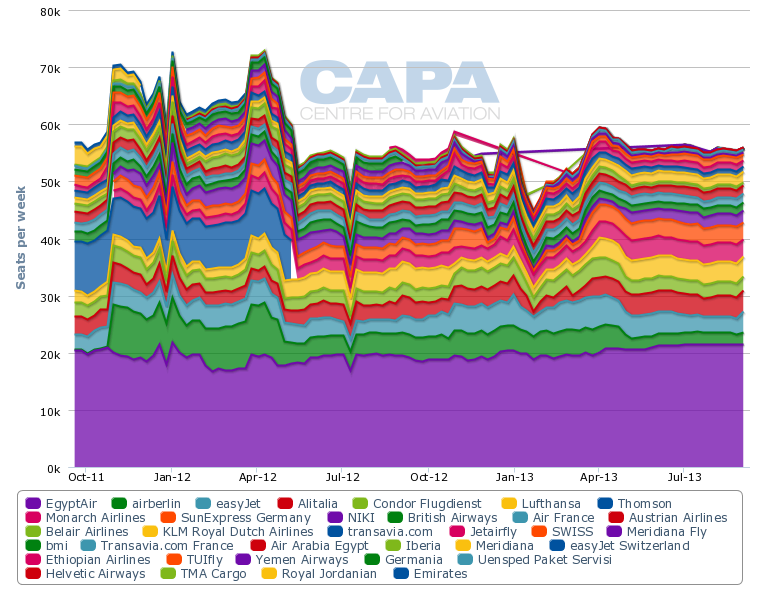 EgyptAir commands nearly 50% of the capacity in and out of Egypt, with Saudia the biggest single competitor, its 36,000 weekly seats giving it a 7% market share. 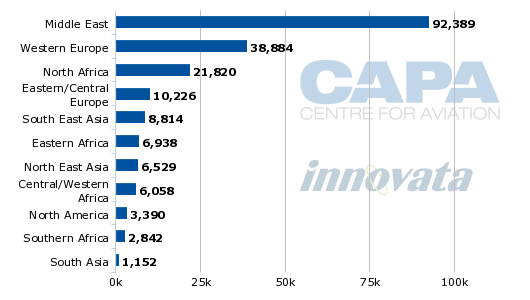 Middle Eastern traffic has been rising and will spike in Jul-2013 due to increased summer capacity to Saudi Arabia, Egypt’s biggest single market. Saudi Arabia is a fast growing inbound tourism market for Egypt and has been less impacted than European arrivals. Saudi Arabia as well as the UAE and Kuwait have large populations of Egyptians. Over the summer season EgyptAir will significantly increase frequencies to Saudi Arabia including more than doubling Alexandria-Madinah from three times weekly to daily and Alexandria-Jeddah to double daily from 11 times weekly. Cairo-Abha will become a daily service from 31-Mar-2013, up from five times weekly, EgyptAir competes with Saudia on the route. Cairo-Qassim will be launched with a daily service from Jun-2013 and frequency on Sharm el-Sheikh-Jeddah will increase from twice weekly to five times per week from Jun-2013. Egypt’s Western European traffic fell sharply in May-2012. This appears to have been almost entirely due to the withdrawal of leisure airline Thomson which operated 7,800 one-way seats per week in April-2012. Arrivals from the region have been relatively flat since. EgyptAir confirmed in Jan-2013 that it will add Manchester and Toronto to its network from Jun-2013. Manchester will be served five times weekly operating 720 one-way seats per week using a Boeing 737-800. Toronto will be served four times per week with a Boeing 777-300ER, offering 1,356 one-way seats per week. The airline previously planned to launch the Toronto service in 2011, its second North American destination, but this was postponed due to the revolution. EgyptAir faces no direct competitors on either the Toronto or Manchester routes. The airline signed a codeshare agreement with fellow Star alliance member, Air Canada in Mar-2012 with EgyptAir placing its code on Air Canada’s London-Toronto and London-Montreal services. Air Canada in return placed its code on EgyptAir's services between Cairo and London and Frankfurt. EgyptAir said the Canadian market was an important tourism and business destination and was part of the carrier’s expansion strategy to North America. EgyptAir has responded to weak demand from the United States by reducing frequencies on Cairo-New York from daily to five times weekly in Jan-2013. However, the daily service is scheduled to be restored in May-2013, using a Boeing 777-300ER according to Innovata. The carrier has also long harboured ambitions to serve Washington Dulles. EgyptAir is working to expand its relatively limited intra-African network which consists of 17 destinations, focused along the Mediterranean, Eastern Africa and Western Africa. The airline is in the process of acquiring 49.9% of suspended Ghanaian domestic carrier CTK-CityLink in a bid to tap into Western Africa’s economic growth and potential feed into its Cairo hub. EgyptAir’s plans for CTK in the short-term would be for it to catch up to competitors by entering international routes around West Africa. The move follows Ethiopian Airlines’ decision to take a stake in Togo’s ASKY as a means to access Western Africa without establishing a new affiliate. CTK in Aug-2012 suspended passenger flights, which it commenced in Sep-2003, after previously focusing on charter and private flights. CTK schedules before its collapse indicate the carrier operated three domestic routes from its Accra hub to Kumasi, Takoradi and Sunyani. Further regional growth could result from the Egypt and Liberia agreement in Apr-2012 to increase air access between the two countries. But an expected service between Cairo and Monrovia, through Accra within a year has not yet commenced. EgyptAir has also announced a range of capacity increases from Cairo, starting with Madrid moving from daily to eight times weekly on 01-Apr-2013. Rome will also increase to double daily from 11 times weekly. The bulk of the changes take effect on 01-Jun-2013 and include Cairo-Doha moving from 10-times weekly to double daily, Kano going from five to six times weekly and Baghdad from three to four-times weekly. Cairo-Athens will move from 10-times weekly to double daily. The current Cairo-Accra service will continue on to Abidjan with a daily service, up from four times weekly, while Harare will be added to the existing four times weekly Cairo-Dar es Salaam service. Capacity will also be increased on Cairo-Bahrain from 01-Jun-2013 with the replacement of the 76-seat, single class Embraer E170 service with a two-class 145-seat A320. The daily Cairo-Tunis service will also be up-gauged from an A320 to a two-class 185-seat A321 from that date. 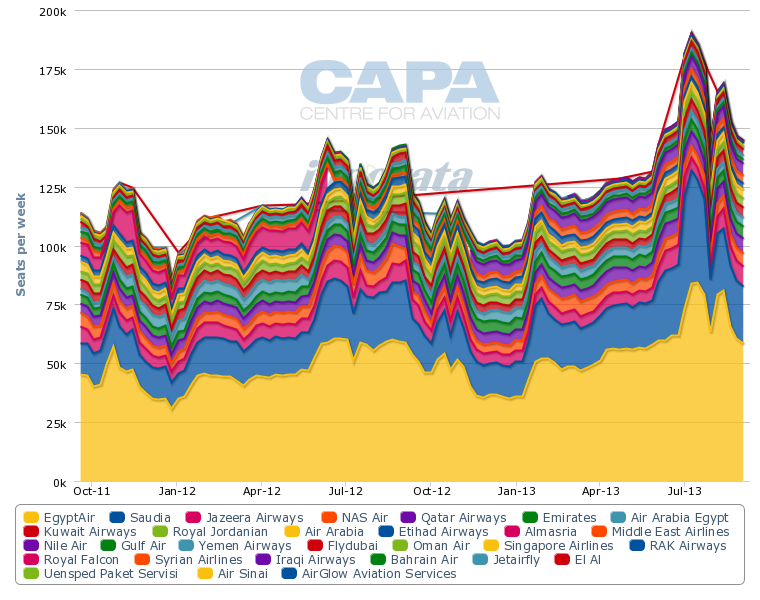 Plans to increase frequencies between Cairo and Beijing from three to four times weekly in Dec-2012 did not eventuate, according to Innovata. A proposed service between Cairo and Ho Chi Minh City, announced in Jul-2012 has also not yet commenced. EgyptAir Asian network includes four times weekly services between Cairo and Guangzhou as well as daily from Cairo to Bangkok and on to Kuala Lumpur using a Boeing 777-300ER. The carrier cancelled its three times weekly Sharm el Sheikh-London Heathrow service in Oct-2012 in favour of boosting frequencies on Cairo-London Heathrow from 11 to 14. EgyptAir had the Sharm el Sheikh route to itself, but competes with British Airways to and from Cairo. EgyptAir suspended services to Japan in Feb-2011 following the political unrest in Egypt. The carrier resumed twice weekly Cairo-Tokyo Narita services in Apr-2012, increasing to three times weekly in Sep-2012. This will be reduced back to twice weekly from 31-Mar-2013. A twice weekly Cairo-Osaka Kansai service was reinstated in Dec-2012 using A340-200 aircraft. EgyptAir is the only operator on both routes. EgyptAir is considering options to develop and grow its fleet, including replacing and retrofitting a number of older aircraft. The carrier plans to increase its fleet operated across its three subsidiaries, EgyptAir, EgyptAir Express and EgyptAir Cargo, from 79 aircraft to 83 by the end of 2014. It has just one order, for an A330-300E, which is due for delivery in 2014. Of its total passenger fleet of 76 aircraft, 20 were built in the 1990s. EgyptAir Express has a monopoly position on the domestic network of 10 destinations which it serves with a fleet of 12 Embraer ERJ170 aircraft. Thanks to a conspiracy of events, EgyptAir is in intensive care. There is little it can do about the continuing unrest in its home country, but a targeted growth programme is being implemented, with apparent strategic thought. It will not be easy to recapture profitability but the carrier is expanding and diversifying its network in Africa, Europe and the Middle East to improve revenue and help offset the effects of a tourism market that, while recovering, remains subject to further political upheaval.